By a vote of 6-5, the East Baton Rouge Parish School Board has voted to reapportion itself into nine single-member districts for the Nov. 4 primary election. Qualifying will be held Aug. 20-22. Under the plan, there are five majority white districts south of Florida Boulevard, three majority black districts north of Florida Blvd. and a fourth majority black seat in the Mid-City area. The plan was opposed by an unusual group of opponents — the East Baton Rouge Republican Party, the EBR Democratic Party, and the NAACP. 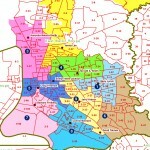 The GOP said the plan was unnecessary and was designed to create larger districts that BRAC, the Baton Rouge Area Chamber, will attempt to control by spending large sums of money in new districts that are too large for ordinary citizens to reach in the short time available to campaign.